COLUMBIA, Mo. – One of the largest variable expenses in poultry production is heating the barns in which chickens and turkeys are housed. Now, a team of researchers and engineers from the University of Missouri have developed a waste-heat recovery system that could lead to significant savings in propane costs for farmers and producers heating their poultry barns. Scientists believe the energy efficient ventilation system also could be critical to maintaining air quality for birds, keeping birds healthier. Almost 100,000 poultry barns exist in the U.S., and total farm value of poultry production exceeds $20 billion a year, according to statistics released by the U.S. Department of Agriculture (USDA). Typically, turkey poultry farmers will spend about $30,000 a year in propane costs in one brooder barn to maintain an ideal temperature for raising healthy birds. The waste-heat recovery system designed by Mizzou scientists may help defer some of these costs—even in colder climates. Xu, who also served as a consultant in use of geothermal heating and cooling systems for the 2008 Olympic facilities in Beijing, and Tingsheng Xu, a research associate at the MU College of Engineering, devised the waste-heat recovery system that works with the air ventilated from poultry barns. The warm air that is normally exhausted as waste is pushed through a grid of tubing located in the fresh-air ventilation inlets. As the air exchange is made, the heat from the exhaust warms the fresh air; therefore, heaters located in the barns have to work less to heat the inside of the buildings. The team licensed the technology from MU and started production in Boonville, Mo. Waste-heat recovery systems have been installed in turkey, broiler and egg layer barns in Missouri and Minnesota. Xu and his colleague Jeff Firman, a professor of animal sciences in the MU College of Agriculture, Food and Natural Resources, have noticed significant improvements to poultry production that could help farmers. Impacts could include lower labor costs, environmental improvements and reduction of disease among chickens. Xu has produced more than 48 of the units and has 100 more in production. The USDA has granted Xu and his team more than $360,000 to further test and develop the technology with other grants from the USDA pending. 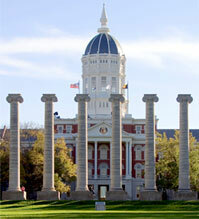 Xu recently presented his findings at the Missouri Poultry Federation’s annual conference.